A Chamber of Commerce blue sky greets a group of smiling children, yellow bandanas around their necks, as they step out of their school bus and onto the grounds of the San Antonio Stock Show & Rodeo. As the curious students file through animal exhibits and auction barns, volunteers from CPS Energy can be found sharing their knowledge and passion for the annual event, now in its 63rd year. For decades, CPS Energy employees have rolled up their sleeves and slipped on work gloves and boots to volunteer for the Stock Show & Rodeo, saving up vacation time to set-up barns for livestock shows, answer questions about farm animals, pick up trash at fairgrounds, shovel manure and do just about whatever it takes to support the annual event. The local Stock Show & Rodeo, established in 1950, lassos more than one million visitors each year. 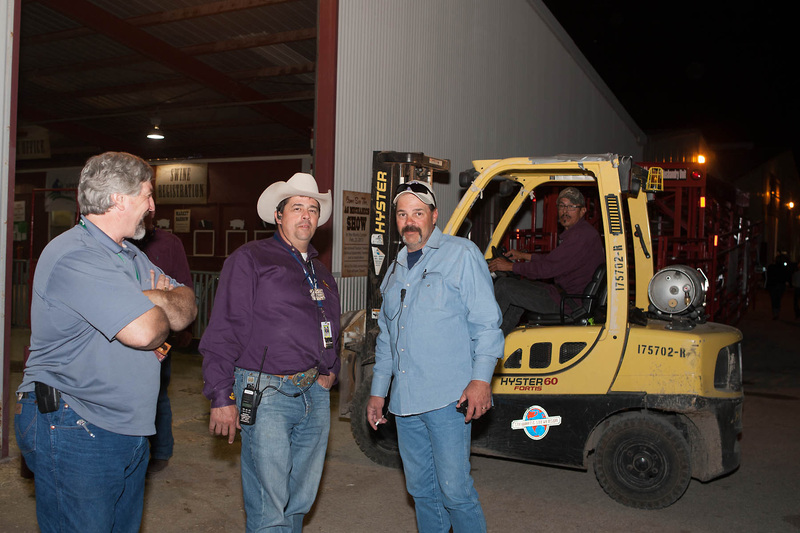 Amidst the bull riding, roping and carnival games, volunteers like Edwin Martin and Ginger Bodiford work behind the scenes to make sure families have a safe and memorable experience. Martin is a production operations supervisor at Calaveras Power Station, home of the Deely and Spruce coal plants. Every year, Martin dedicates three weeks of his vacation time to oversee more than 1,200 volunteers as a vice chairman of the Livestock Committee. On top of that, he has year-round duties that include managing a budget, contracting with trucking companies and scheduling hundreds of volunteer shifts. Edwin Martin, center, a production supervisor at CPS Energy, oversees more than 1,200 volunteers each year at the Stock Show & Rodeo. Martin has deep roots with the Stock Show & Rodeo. As a kid, he showed lambs and steers. Motivated by a passion for raising and showing livestock, Martin sees his volunteer time as payback for fond memories. The work of volunteers like Martin frees up money for student scholarships. Last year, more than $10 million, in the form of scholarships, grants, endowments, auctions, the calf scramble program and show premiums were paid to youth. Since 1984, the rodeo’s educational commitments have exceeded $123 million. But even those children who don’t compete benefit from visiting the Stock Show & Rodeo. Ginger Bodiford, a CPS Energy data control clerk for Overhead Engineering, sees those benefits first hand. A member of the Livestock Committee, Bodiford has been volunteering for more than 30 years. These days, she volunteers in the Animal Adventures exhibit, where kids learn about farm equipment and how animals are raised. CPS Energy is proud of its employees’ long tradition of community service, says Lori Johnson, director of corporate responsibility.